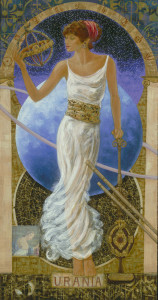 The Muse series by Peter Nixon is a fascinating take on the nine Muses of Greek mythology. As shared below, Nixon has specific meanings behind his beautiful goddesses. 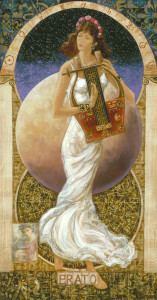 Muses originate in Greek mythology as the nine daughters of Zeus. They are the goddesses that inspire the domains of science, literature and the arts. 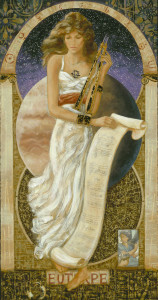 Authors would often invoke the Muses when creating their works, be it songs or poems. Each Muse is associated with an item that refers to their specific domain. For instance, Erato, the Muse of lyric and romantic poetry, has a lyre-like instrument. In his 2013 Muses series, Nixon incorporates these items with the appropriate goddess. 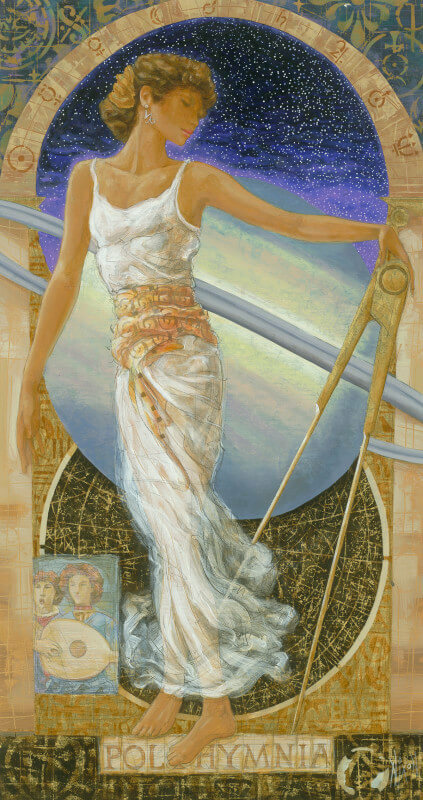 Some are not as obvious – Polyhymnia, the Muse of hymns, has a compass drawing tool since she also inspires geometry. Nixon decided, however, that something more was needed for depicting these goddesses. “It’s been one of those subjects that has been done by artists in the past, and I wanted to put my spin on it, so I brought the planetary element in,” he says. In his paintings, each of the Muses is seen with a planetary body. 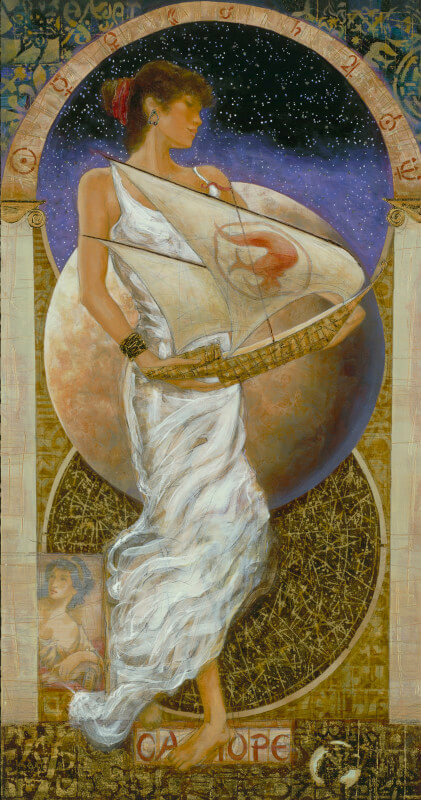 They are: Calliope, Mercury; Terpsichore, Venus; Thalia, Earth; Clio, the Moon; Erato, Mars; Polyhymnia, Saturn; Euterpe, Jupiter; Melpomene, Neptune; Urania, Uranus. Nixon explains that this planetary theme is based on the Pythagorean concept of harmony. 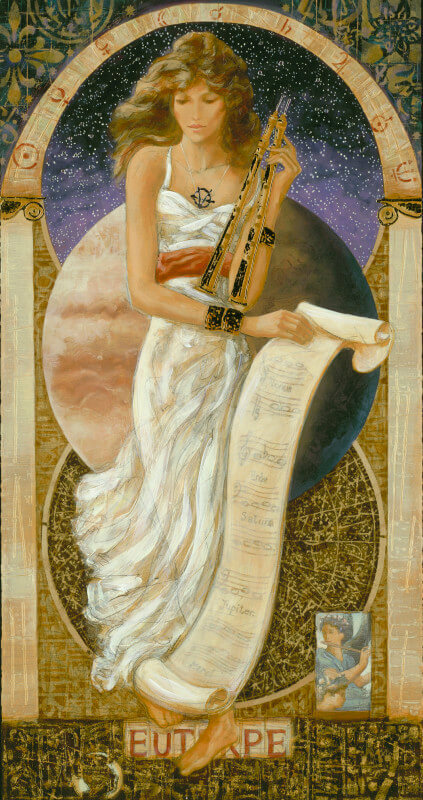 The Greek word harmonia speaks to the joining or fitting of things together, and in the case of Pythagoras, his “harmony of the spheres” theory brings together music and celestial bodies. The “harmony of the spheres” is an ancient concept also known as musica universalis (universal music), which regards the movements of planets, the Moon and the Sun as a form of music that creates a symphony. This isn’t literal music that can be heard, but instead a mathematical notion. However, if you are interested in hearing the music of our solar system, NASA has transformed the electromagnetic vibrations of space into audible sounds. Jupiter (assigned to Euterpe, the Muse of song) and Saturn (Polyhymnia) are particularly haunting. This musical concept is fitting for Nixon, who loves listening to music while painting, whether it’s classical like Bach or jazz from musicians like Keith Jarret. Nixon is also inspired by collectors he meets through Park West Gallery. He says he finds himself swamped with ideas and motivation after attending an auction and interacting with collectors. These inspiring paintings hold various treasures when inspected closely. Each Muse is accompanied by a small picture, which are 19th century representations of the Muses by artists such as Charles Le Brun and Simon Voulet. 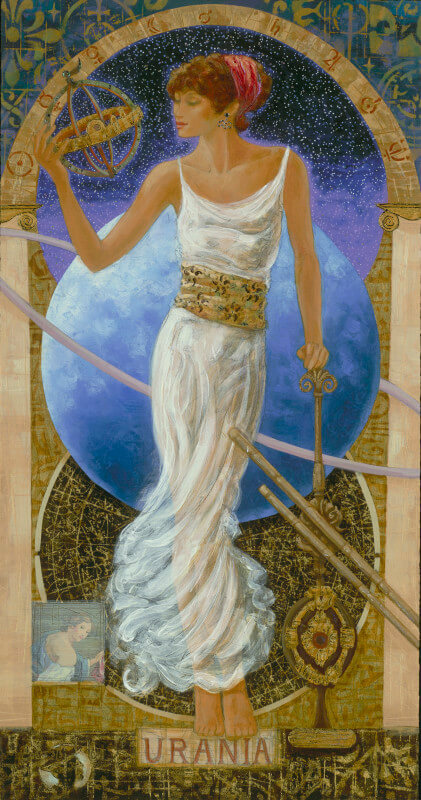 Even the earrings worn by the Muses relate to their planet or star sign. Nixon says he is always on the lookout for subject matter and is fascinated by music, science, art history and history itself. He carries around a notebook to record any ideas that come to him – or should we say, when the Muses intervene.